In 2015, Webzen authorized the Tianma studio to develop M.U Origin to bring a MMORPG experience similar to the first title of the franchise, but on mobile devices. The game was particularly well received in Asia. 4 years later, Tianma finally presents her sequel: M.U Origin 2 on Android. The gameplay is neat and promises a better experience with detailed and realistic graphics. M.U Origin 2 was first published on the Asian market by Tencent and Webzen. The game is the first place in the charts. 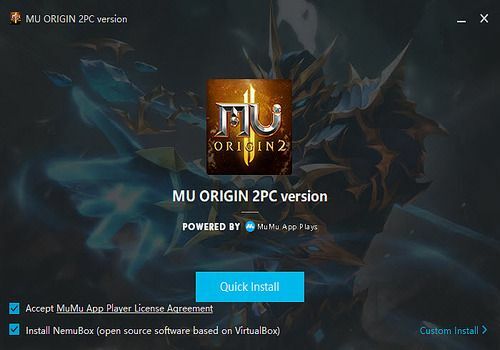 M.U Origin 2 is now available in English and in a PC version. This is not a real PC version but rather a fake port using an Android emulator. this version is free and stable. Fallout 1.5 is Fallout, but not exactly. It's the same game, but not quite the same. In short, it is an unexpected opportunity to immerse yourself in the universe of the mythical RPG and to rediscover all the mechanisms, the surprise effect in addition. Immerse yourself in the deliciously frightening world of Undertale, for free. Langrisser Mobile's PC Client is the best way to play the mythical RPG strategy game without having to deal with a small smartphone screen and slow connections in the subway.